Episode 3 of the Strong Bad series, titled Baddest of the Bands, is coming to the WiiWare service in October. Below is a portion of the press release that was just sent out to the media which gives a little insight into the story line the new game will feature. Rock and roll! Hurting for cash, Strong Bad sets out to dominate the Battle Royale of the Bands. Can he rule the stage and win the big prize? Or will he be drowned out by the competition? 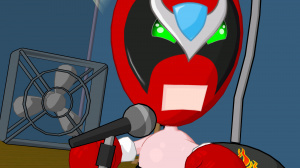 Find out in Strong Bad Episode 3: Baddest of the Bands, coming to PC and WiiWare this month! There are also brand new screenshots of the game as well as two new videos of the game in action that you can check out below. We'll have more information on Strong Bad: Baddest of the Bands as it becomes available, as well as a full review of the game when it hits the WiiWare service. Gah, I'm getting flooded with too many WiiWare releases. Strong Bad 2, then Mega Man 9, then Madstones, World of Goo, Strong Bad 3.... and I still want Bomberman too. And then there's Animales down the line along with Space Invaders Get Even. Damn. ThIS IS GOIN TO ROCK! This episode doesn't look that great so far. I hope the mini-game in this one is awesome, like some GH, etc. parody. Presuming you get your review copy early again WWW (as with ep 2), why not post the review before the games launch? I still can't see anything that makes Strong Bad worth purchasing. I guess I'll let everyone else have all the fun. This is not really news. We already know that the game is coming. Ep. 4 will come in November and Ep. 5 in December. This wasn't posted so much as an announcement as it was a chance to post the new screenshots and game play videos. WiiloveitOnline: There's an embargo, we can't post the reviews until the games are out! As Drake says, these publishers are pretty sticky about how and when you can release a review. We even have to be careful what we say in previews or impressions articles. Thats a shame, it would be great to have some reviews before the games are out, but, does that means you know a bunch of things about the upcoming games that you just can't mention? Generally they'll let us know what we can/can't talk about. Just like in some of the interviews they'll give something away and then at the end ask us to leave out certain parts. We always try to accommodate the publishers as they're nice enough to give us this information and some of these games ahead of time. IGN has the WiiWare exclusive on World of Goo so we can't put anything up before Monday when the game is released. Just a fact of life. But we can still play the PC version to get a head start on the WiiWare release coming on Monday. Reviews before the game is released? Those who are excited by the game are spoiled by anything that's in the review, before they have a chance to purchase it. First, let the excited people download the game. Then, give a review to help those who're undecided. That's an even worse idea! Reviews should be released with the game, simple as that. The only reason some people review games before, is so that they get the review out before anyone else. Luckily, WWW has more class than that. And they're like one of only two sites that care about WiiWare anyway. If you're on the fence about getting the game, you can wait a couple days for the review. If you want the game so much, you'd sell your spouse or loved one, then a review doesn't matter. If you hate the game more than your in-laws, than a review won't do much to change your mind, in most instances. So there's absolutely NO benefit to reviewing the game before it's release. @x.supermario.x--Love the family members analogy! @Objection_Blaster. I found it quite amusing myself. And he has a point too. Games should never be reviewed before they're released. Not only does it ruin the game for you before it's released, but it also could've had some last-minute changes which, though probably minor, still affect the game as a whole. I also agree that this is one of the few sites that actually truly gives a crap about Wiiware. Most sites just think of it as an afterthought (coughIGNcoughcough). I don't quite know if you are being sarcastic or not. That malevolent smiley doesn't help me either. Still, something's telling me you're just exaggerating your opinion to make a point. Hope so at least. As for Strong Bad, this episode--at least in terms of story--doesn't appeal to me as much as the second one did, and I didn't even purchase that one. Eh, in the end, I will be waiting for all the episodes to come out before I pick the best of the bunch. I also don't get why other sites don't take the Wiiware service more seriously, it's actually maybe the most exciting feature on the Wii for me right now, since it offers so many diverse, interesting options at such a reasonable price. Theres hardly a mention of it other places.